If you want your motorcycle to stop effectively, you’ll need to service your brake system. Once you’re finished there, you can improve your bike’s handling by replacing the wheel bearing and steering stem bearings. Motorcycles use either hydraulic disc brakes, drum brakes, or a combination of the two. You’ll usually find disc brakes on the front and drum brakes on the rear of your bike. Hydraulic disc brakes consist of a disc that attaches to the wheel, a brake caliper and piston, hoses, and a master cylinder and brake lever. If your hydraulic brakes feel spongy, slow to respond, or are dragging, then it’s time to service them. The easiest fix on hydraulic disc brakes is replacing the brake pads with new ones. If you’ve picked up a motorcycle that has been sitting for a long time, this is a good idea. Unscrew the caliper mounting bolts. Remove the caliper from the disc. Unscrew the mounting screw and replace the static pad. Remove and replace the pad that rests on the piston. Use a C-clamp to depress the caliper piston before you install the new pad, otherwise I might not fit. Reinstall the caliper on the disc and tighten the mounting bolts to the proper torque. Refer to your motorcycle shop manual for the exact removal and assembly procedure. Brake fluid that hasn’t been changed or that has been sitting for a long time will often get gunked up and harden. This can negatively affect braking power or render the brake completely useless. To properly clean and service gunked up and dirt hydraulic disc brakes, you’ll need to remove everything. Unscrew the mounting bolts to remove the caliper from the forks. Before you disconnect the hoses, pump the brake lever while the calipers are apart and push the piston out of the caliper. Be sure to have something to catch any brake fluid. 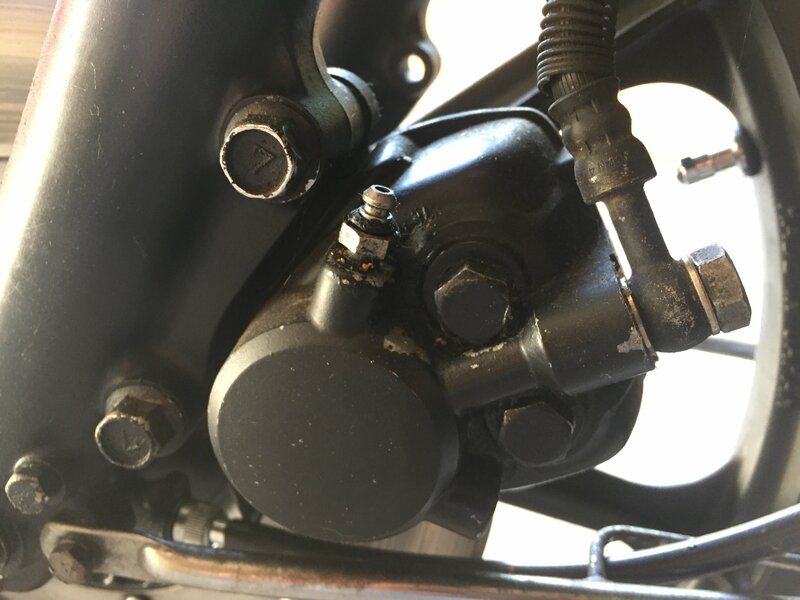 If you have a bike with a master cylinder that doesn’t work, you can swap it out for one that does, add some brake fluid, and push the old piston out. Be very careful not to scrape or damage the caliper piston when you are removing it. Once the brake caliper pistons are removed, you can access a rubber seal that sits in a groove near the top of the piston chamber. Remove the o-ring seal before cleaning the caliper. Clean the inside of the caliper with brake fluid or brake cleaner. You can try to burn off any corrosion that’s stuck inside the piston slot. Blow out the caliper with compressed air and let it dry. Apply some brake fluid to the outside of the brake piston and press it back into its slot and reassemble everything. To disassemble the master cylinder pump, you’ll need to remove the dust cover, remove a circlip, and the remove the plunger shaft. If the parts are too badly gunked up, corroded, or damaged, you can usually find a replacement kit. If the entire master cylinder is badly corroded, pitted, or damaged, you are better off replacing it all together rather than trying to repair it. Fill your master cylinder with the proper brake fluid. Attach a clear hose to the caliper bleed bolt/screw and place the open end in a container to catch any brake fluid. Pump the brake lever to remove any old fluid from the system. Add more new brake fluid to the master cylinder to keep it at the proper level. Continue squeezing the brake lever and closing the bleed screw until the system is full. Pump the brakes several times and then hold the lever down. Open the bleed screw and allow any air to escape the system. Repeat the bleeding process until there is no more air in the lines and the lever feels firm to pull. File down the leading edge of your brake pad about ⅛ inch at 45 degrees. Confirm that the pad or piston is not binding inside of the caliper. Cut a relief in the brake pad down the the wear limit level. Use a hacksaw to cut a gap into each brake pad parallel with the rotation of the brake disk (parallel to the ground). Drill holes into your brake discs. In the rear of your motorcycle, you’ll probably find a drum brake. Drum brakes work with a brake shoes that makes contact with the brake drum when the lever is pressed. If your motorcycle has been sitting for a long time, you should replace the drum brake shoes and clean the inside of the brake drum. To remove the brake shoes, simply lever them off the cam and pull them off. They will be connected by a pair of springs. Hang on to the springs incase your replacement brake shoes don’t come with them. You can remove some of the corrosion and grime from the inside of the brake drum with sandpaper. Do not breathe in any. It’s a good idea to wear a respirator when servicing brakes. When reassembling your drum brakes, grease the brake cam and pivot post, connect the brake shoes with their springs, and slide them into the grooves of the pivot shaft.